On the Info screen, click the Protect Document button. The Restrict Editing pane appears. Place a checkmark in the box below Editing Restrictions. The Editing Restrictions area expands, as shown. Specifically, the list of exceptions appears, but your focus for now is on the menu, as illustrated in the figure. No Changes (Read Only): The document cannot be edited or changed. Tracked Changes: Modifications can be made, but only with the Tracked Changes feature active. Comments: Other authors can insert only comments. Filling in Forms: Only content controls are available for typing text or adding information to the document. If you’re collaborating and you want to ensure that your text is unmolested, choose Tracked Changes or Comments. Click the button Yes, Start Enforcing Protection. Type a password into the dialog box: once to set the password and again to confirm. Click OK to begin enforcing the editing restrictions. 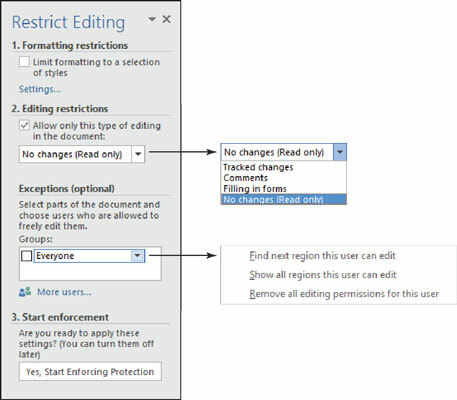 If you choose the restriction levels No Changes (Read Only) or Comments, you can set any exceptions and create editing areas. The restrictions remain applied to the document until you remove them.